After the Office of Student Conduct determined that Kappa Alpha (KA) had violated the University’s Anti-Hazing Policy in late April, the fraternity was removed from campus and will not be permitted to reestablish its chapter for another three years, according to Office of Sorority and Fraternity Life spokesperson David Furhman. The fraternity may apply during the 2017-2018 academic year for colonization the following year. Both Furhman and a spokesperson for the Office of Student Conduct declined to describe the details of the hazing allegations. The fraternity will not be guaranteed a return to its house at 14 Eagle Row — now a themed house home to a group dedicated to media, arts and literature — and must apply for housing upon their return, according to Furhman. While returning to their former house remains one of the goals for the KA members, the primary objective is for the fraternity to return to campus, Durst said. He added that while the fraternity’s time at Emory has ended, the sense of camaraderie among members will continue. Restaurant and tavern Ink & Elm shuttered last week, leaving a vacant property just right of Slice and Pint, after 21 months in the Emory Village. The restaurant, known for its oysters and bourbon, according to Atlanta Eats, announced via its Facebook page on May 26 that it would be closing down on May 30. 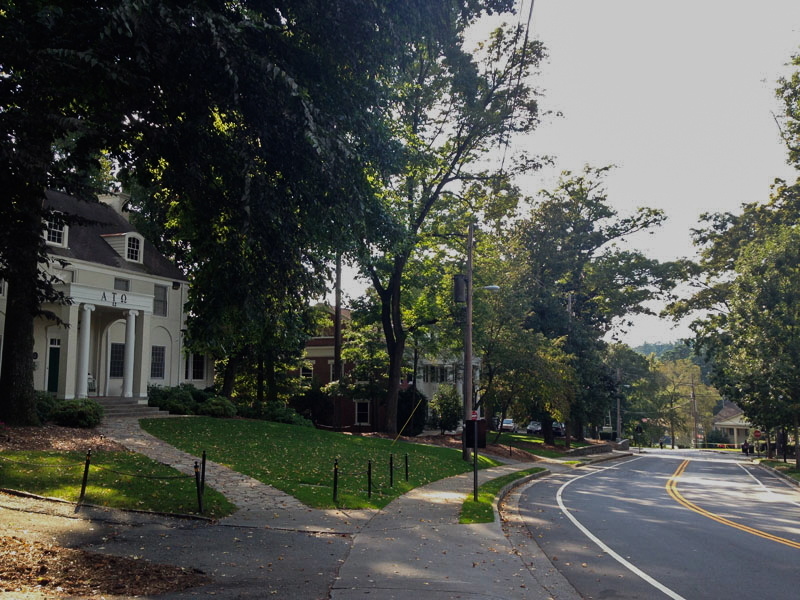 The Emory Village Alliance is considering several potential restaurants to take its place, according to Emory Village Alliance property owner Stuart Meddin. He declined to name the restaurant candidates. Rising College senior Jonathan Weiss, who headed to Ink & Elm for coffee on a daily basis, said he was deeply surprised when he found via Snapchat that the restaurant was closing its doors for good, as the place was generally packed during lunch. “I would say they definitely need something similar there, a place where students can get a coffee, where faculty and students can have a professional conversation,” he said, adding that he hopes whatever replaces Ink & Elm will have the same “multifaceted” element. Adam Goldstein, a rising Business School senior, lamented the loss of a coffee shop near campus where he could escape the constant crowds of the Oxford Road Building’s Starbucks. What he’ll miss most, Goldstein said, is the people who worked there. The restaurant and its owner did not respond to calls, emails and Facebook messages from the Wheel. Students can expect to see new several new restaurants and improved food quality when they arrive back on campus this fall as a result of the University’s switch from its former dining contractor, Sodexo, to Bon Appetit in May. Free trade brand Kaldi’s Coffee, for example, will stand where Dunkin’ Donuts once stood in the Dobbs University Center, and a new Highland Bakery will have opened in the Chemistry Building. Maru, a mix of South Korean, Japanese and Chinese entrees, will have replaced Sodexo-owned and operated Star Ginger, while the Dobbs Market and Eagle Convenience will feature more healthful and vegetarian options, according to Furhman, who also serves as director of Emory Dining. Kaldi’s, according to Furhman, will continue Dunkin’s early-morning to late-night opening hours, while the Cox Hall Food Court and Dobbs Market will each maintain their regular semester hours and current interior design. Kaldi’s, however, will provide a variety of lunch and dinner options — and freshly-baked cookies — to satisfy students’ needs after Cox and the Dobbs Market close for the night at 7 and 8 p.m., respectively. While Eagle Subs on the floor below may face new competition, Eagle Convenience will offer “more variety,” including gluten free options, Furhman said. Not only will the Dobbs Market offer more vegetarian options, but it will also include “more farm to table” foods and an Indian food station, Furhman said. The Cox Hall Food Court, he added, will also bump up its quality: Top Hat Pizza will bake its doughs and mix its sauces from scratch each day. Rising College senior Aileen Rivell said she looks forward to Cox and the Dobbs Market’s higher quality — the only downside, she said, is that she’ll be less motivated to cook dinner in her apartment. “Emory has always prided itself in being an environmentally friendly and sustainable school, so this just makes me more proud of my school,” Rivell said. While the Business School’s own Highland Bakery and the remainder of the Cox Hall Food Court will remain the same, Zaya Mediterranean Grill in Dooley’s Den will continue operations until Thanksgiving break, when it will be closed for renovations, according to Furhman. The building will reopen the following January. After more than a month of construction, a glass-walled space for the discussion and celebration of Hispanic culture will open on the second floor of the Dobbs University Center during orientation this fall, according to Michael Shutt, the interim director of the Center for Diversity and Inclusion (CDI). The Centro Latino, which will serve not only undergraduate students, but also graduate students, faculty, staff and alumni, “will be a source of support and connection” for Emory’s Hispanic community. Along with Emory’s Black Student Union, the Division of Campus Life has also included the Centro Latino in discussions regarding the new Campus Life Center, according to Shutt.